The original Carrabba’s in an upgraded setting. : The original Carrabba’s Italian Grill, long located in Upper Kirby, now inhabits a larger building constructed on the same lot. The space is almost always packed, so come early or just grab a seat around the pizza bar where you can watch your pie bubbling in the wood-burning oven while sipping a glass of Italian wine. Other favorites include the chicken “Bryan Texas,” a grilled breast topped with creamy goat cheese and sun-dried tomatoes and plated with fettuccine Alfredo. Portions are quite large, so prepare to share if you’re ordering the house salad with Parmesan dressing or the chicken soup that looks to have almost an entire breast of chicken in it. Traditional pasta dishes also satisfy, and if it’s Wednesday don’t pass up the osso buco special with its rich bone marrow center. 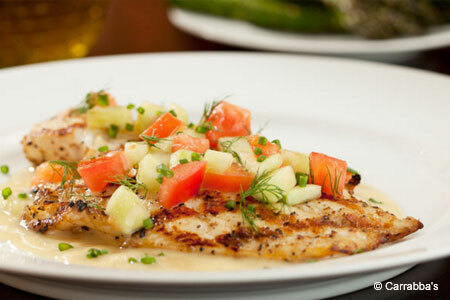 Carrabba’s also offers a gluten-free menu, a menu just for kids and a lengthy wine list. Desserts are predictable, but hope that you happen to pop in when the kitchen whips up some of its special mini cannolis.